Ancient Egyptian games were a lot like some games people still play today. 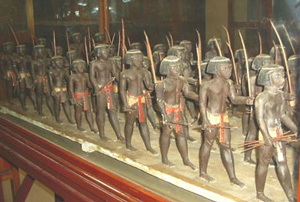 Some Egyptian games were traditional African games. 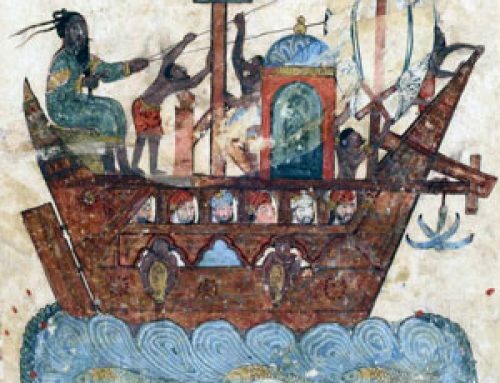 The Egyptians learned other games from their West Asian neighbors. 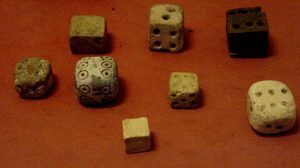 People in ancient Egypt played games with pieces like checkers or mancala or senet. 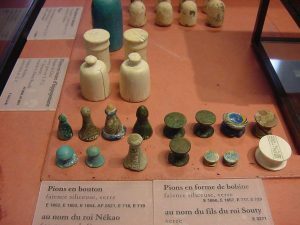 Senet might be the oldest board game (or mancala might be). The Ancient Egyptian game of senet was a game for two people. You each got five pieces, and to win the game you had to be the first to get all of your pieces off the board. The board had three rows of “houses” (spaces), with ten houses in each row. You started with one player’s pieces on the first, third, fifth, seventh, and ninth house, and the other player’s pieces on the second, fourth, sixth, eighth, and tenth houses. Instead of rolling dice, you tossed four sticks to decide how many spaces you could move on each turn. The sticks were black on one side. If they landed all four black, you moved five spaces and go again. No blacks? Move four spaces and go again. If they landed three black, move three spaces and lose your next turn. Two black? two spaces and lose your next turn. Only one black? one space and go again. Only one piece can be on a space at a time. But there are more special rules. You can read about them here. 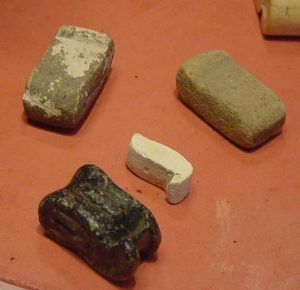 Egyptian kids played games like jacks, using animal knucklebones or small stones. (Knucklebones are really the ankle bones of sheep). Sometimes they made artificial knucklebones out of clay. They played games with dice, too. One popular board game was Hounds and Jackals (though we don’t really know what the Egyptians called it). You threw knucklebones to decide how many holes to move your piece, and the pieces were tall sticks with the heads of dogs or jackals. Egyptian kids also had toys to play with. They had clay rattles and little animals and people shaped out of clay. If you could afford them, you could also get wooden toys. 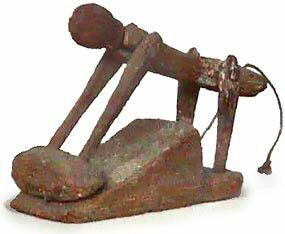 Some wooden toys had moving parts, like a hippopotamus with jaws that could open and close. This one has a woman grinding grain: you pull the string to make her move the grinding stone back and forth. The fanciest dolls were made of cloth, and stuffed with papyrus reeds. 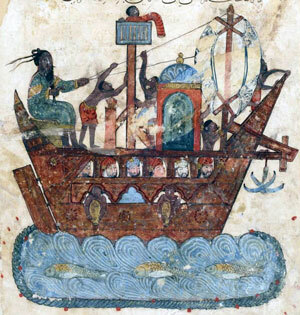 Ancient Egyptian boys and girls were outside nearly all the time, because their houses were small, dark, and crowded. Ancient Egyptian kids liked to play running and jumping games. Boys and girls loved to swim in the river to cool off and get clean; they knew how to swim the breast stroke and the crawl stroke. They also liked to wrestle and box, and dance in circles. On the right, the two boys are wrestling. One boy is sitting on the other boy’s head. The girls called one dance “pressing the grapes“; that’s the dance in the picture to the left. They’re holding hands in a circle. 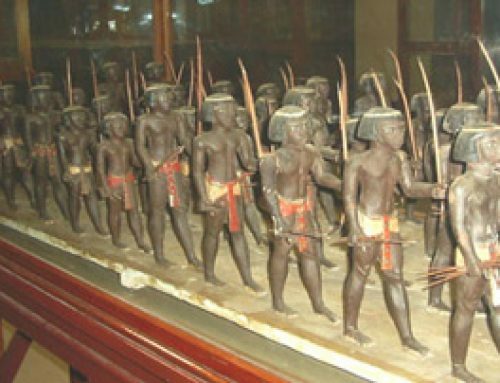 Kids made balls out of leather or woven papyrus and stuffed their balls with straw or (once horses came to Egypt) horsehair, to play ball games like juggling. Looking for a second source to cite? 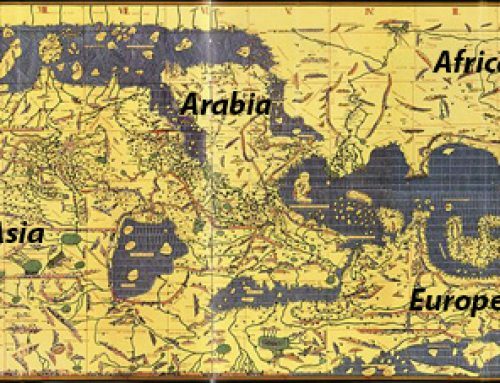 Check out this article from the Ancient History Encyclopedia. Did you find out what you wanted to know about ancient Egyptian games? Let us know in the comments! Cite this page: Carr, K.E. 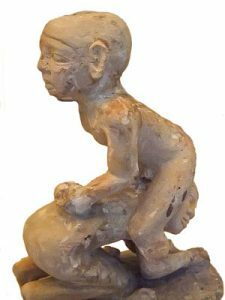 Ancient Egyptian games: play and toys in ancient Egypt. Quatr.us Study Guides, June 14, 2017. Web. April 21, 2019. I’m writing a novel that takes place in Cairo, Egypt, in 3070. I needed some games that children played for the opening scene. Thank you so much! This has helped greatly! Sorry to hear it, Stephen! What were you looking for? I’d be happy to answer your question. Wonderful! I’m delighted to hear it, Damian. You’re welcome! That’s very kind of you, Abdessiam! Super helpful for a project im doing in 6th grade. Happy to hear it! Good luck with your project, Isaiah! If you don’t want to juggle, you could try playing jacks? It’s our modern version of knucklebones. I think juggling would be a wonderful choice for you! Start by getting those soft juggling balls that are easier. Everybody will be so impressed when you learn how to do it. I learned a lot about the games in ancient Egypt. Wonderful! I’m glad we could help. Feel free to ask if you have any questions.